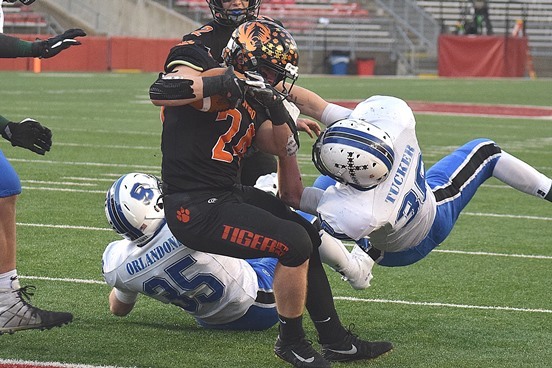 The Wisconsin Football Coaches Association and the WIAA have come out with a revised conference realignment plan that is set to take effect in the 2020 football season. A major change in this plan is the dissolution of the Marawood Conference for football. The new plan published on Feb 8th will see the Marawood teams split between four different conferences, with Auburndale, Marathon, and Edgar joining the Cloverwood with Colby, Abbotsford, Thorp, Athens, and Owen-Withee. Stratford will join the Central Wisconsin Large along with current Cloverbelt member Spencer/Columbus Catholic. Other Members of the CWC Large will be Nekoosa, Amherst, Wittenberg-Birnamwood, Weyauwega-Fremont, Manawa, and Shiocton. Rib Lake/Prentice will go to the Lakeland Conference and play against Ladysmith, Grantsburg, Unity, Lake Holcombe/Cornell, Webster, Hurley, and Flambeau. Football only member Tomahawk will move to the MONLPC Small and face Northland Pines, Bonduel, Crandon, Niagra/Goodman/Pembine, Coleman, and Crivitz. The Cloverbelt gets a makeover with Spencer/Columbus out to the CWC Large, and Colby to the Cloverwood. Elk Mound, Durand, and Mondovi come in from the Dunn-St. Croix conference to join existing members Neillsville/Granton, Stanley-Boyd, Fall Creek, Osseo-Fairchild, and Eau Claire Regis. The Valley Football Association will move to two conferences, with local teams in the VFA-1. Stevens Point, D.C. Everest, Wisconsin Rapids, Appleton West, Wausau West, Marshfield, Hortonville, and Wausau East will make up the new conference. The VFA-2 will consist of Fond du Lac, Appleton North, Neenah, Appleton East, Oshkosh West, Kimberly, Oshkosh North, and Kaukauna. Loyal and WI Rapids Assumption will move the Central Wisconsin Small Conference, joining Pacelli, Iola-Scandinavia, Pittsville, Rosholt, Wild Rose, and Almond-Bancroft. The Great Northern Conference will remain mostly unchanged with just the addition of Hayward/Lac Courte Oreilles to the current football conference members of Ashland, Antigo, Lakeland, Medford, Merrill, Mosinee, and Rhinelander. The first time the full WIAA Board of Control will look at the plan is March 1st. You can see the full conference realignment plan here.